We work to ensure equitable coverage of religious and non-religious beliefs across public broadcasting output. Currently we believe the BBC fails to do this, having hours of programming (often confessional in nature) devoted to specifically religious content, and no equivalent content about non-religious worldviews such as Humanism. In particular, Thought for the Day, in the middle of Radio 4’s Today programme, takes exclusively religious contributions and does not allow the non-religious to also participate. We believe this should change. In today’s large and complex society, broadcasting – especially public service broadcasting – is one of the main ways in which citizens and communities can learn about and from each other; it is also one of the main sources of information for large numbers of people. The right to freedom of speech therefore includes the right of access to broadcasting media for different beliefs, religious and non-religious. For us, broadcasting is important because we want to ensure that humanist voices and perspectives are reflected in public discourse and assist those with humanist beliefs to identify themselves as humanists. We want broadcasters to reflect fairly the religions and beliefs found in Britain and therefore to broadcast programmes aimed especially at humanists. When the Communications Act was passed in 2003, we achieved a considerable success through lobbying the UK Government. The Act defines public service broadcasting as including programmes on ‘religion and other beliefs’, and it specifies that belief ‘means a collective belief in, or other adherence to, a systemised set of ethical or philosophical principles or of mystical or transcendental doctrines’. At the time, the Government made clear that the ‘reference to other beliefs…would include ethical systems or philosophies such as Humanism’. Although the law makes clear that religions and beliefs, including non-religious beliefs such as Humanism, should be treated equally in terms of broadcasting, the BBC continues to resist doing so. We bring pressure to bear on the BBC, on other public service broadcasters and on Ofcom on this and a range of broadcasting issues. We also participated in the BBC’s Standing Conference on Religion and Belief, which advised the BBC on religion and belief issues, until it folded. Thought for the Day is a religious slot that, coming in the middle of the BBC Radio 4 Today programme, obtrudes itself on the general listener. It plainly proclaims to all and sundry five days a week that reflective thoughts on the events of the day come only from people with ‘a faith’. There are different views about the idea of a reflective slot in the middle of a current affairs programme: some see no place for it; others think it is a valuable interlude. For so long as it exists, however, it is entirely unacceptable to exclude some speakers just because they are non-religious. 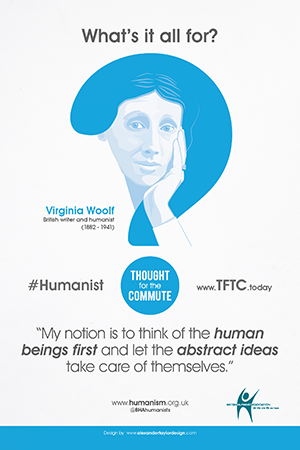 We want BBC Radio 4’s Thought for the Day programme to include humanist perspectives. You can read our 2009 position paper on this issue. Humanists UK has long protested to the BBC about its failure to provide any explicitly humanist programmes, by contrast with the many hours of programmes that are explicitly religious, a high proportion of which consist of Christians preaching Christianity to their own followers. No programme has ever been broadcast on a national network in which humanists have been allowed directly to address humanists on Humanism. (The only possible exception would be the 1955 broadcasts by humanist Margaret Knight on morals without religion, which created outrage at the time for the mere suggestion that morality could be independent of religious faith.) In addition, religious representatives have had a privileged position in advising the BBC, through special committees, and the BBC’s Religion and Ethics department has a history of focusing on religions in its broadcasting about the beliefs found in the world today. Importantly, in 2009, non-religious representatives were included in the Standing Conference on Religion and Belief, a new independent body that liaised with the BBC on matters of common concern to the BBC and religious and belief groups. The first humanist representative is Andrew Copson, Chief Executive of Humanists UK. In addition to our case being taken up by humanists in Parliament, we have had meetings with the Director-General of the BBC, the chair of the BBC Trust and the BBC Head of Religion and Ethics, and will continue to pursue change through those and other channels. We have responded to a number of consultations over the years on broadcasting and the BBC’s output. These include the 2000 Government white paper A New Future for Communications, that led to the establishment of Ofcom; Ofcom’s 2003 consultation on its first broadcasting code; the Government’s 2004 review of the BBC Charter; Ofcom’s 2004 review of public service broadcasting; the BBC’s 2004 consultation on its paper Building Public Value; the 2005 House of Lords Committee on the BBC Charter Review; the BBC’s 2007 consultation on purpose, and its consultation on service licenses; Ofcom’s 2008 consultation on citizens and communications; the BBC’s 2009 review of its TV output; the 2009 consultation on a broadcasting standards code; and the BBC’s 2010 consultation on Radio 4.More recently, in 2013, we also responded to the BBC’s impartiality review, but were disappointed when the BBC announced it did not agree with us that the current approach to religion or belief is unbalanced. We again called for more inclusive broadcasting in Ofcom’s 2015 review of public sector broadcasting, and are continuing to push for change in this area. In August 2002, over 100 eminent figures in British life, all of them Patrons of Humanists UK, or Honorary Associates of the Rationalist Press Association or of the National Secular Society, signed a letter to the Governors of the BBC asking that occasionally Thought for the Day should have a secular or humanist speaker. The editors of the Today programme, into which Thought for the Day intrudes, did broadcast a one-off non-religious alternative by BHA Patron Richard Dawkins in 2002, however the BBC’s official response was to brush the letter aside, first with a letter from the secretary to their Central Religious Advisory Council and then (when a formal reply from the Governors was requested) with a letter stating that the Governors were satisfied with the present policy. In June 2003 the Governors again confirmed their policy. We raised Thought for the Day with BBC Director General Mark Thompson when we met with him in late 2008 to discuss broader issues with the BBC. In 2009 a second non-religious contributor, Arianne Sherine, was allowed to do a ‘Thought for the Afternoon’, as a consequence of the Atheist Bus Campaign, but this also proved to be a one-off. In July 2009, Mark Damazer, Controller of BBC Radio 4, said that the BBC Trust is considering the inclusion of humanist contributors as well as religious ones on the Radio 4 programme Thought for the Day. We wrote to the BBC about it at the time to support the change, and members of the House of Lords also voiced support, but it was not made. Today programme hosts have frequently also called for inclusion of non-religious perspectives in Thought for the Day, for example Evan Davis and John Humphrys. In 2013, during the BBC’s impartiality review, the BBC’s impartiality adviser even told the BBC Trust he wanted to recommend it be made more inclusive, but was blocked from doing so. We will continue to campaign for Thought for the Day, to be made inclusive, for example as part of the ongoing Charter Review. You can email the BBC Trust and add your support to our campaign. Take action right now! You can also contact the Today programme on today@bbc.co.uk and make the case for non-religious thinkers to be included! Please forward any responses to the Humanist UK campaigns team.